Sorry... the 2017 Jeep Patriot is no longer being sold as new. 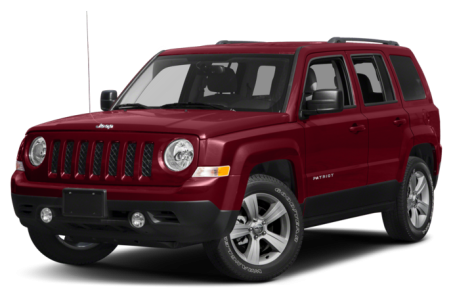 The 2017 Jeep Patriot is a compact SUV that shares its wheelbase and many features with the Compass. This year, the 5-passenger Patriot remains largely unchanged. Two trims are available: the Sport and Latitude. The only substantial difference between the Patriot and the Compass is their exterior styling. While the Compass is more rounded like a modern crossover, the Patriot has a more rugged appearance with high sides and sharp angles at each corner. Front fog lights and 16-inch steel wheels come standard. Skid plates, tow hooks, and larger 17-inch aluminum wheels with all-terrain tires are optional. There are two 4-cylinder engine options for the Patriot. Both the Sport and Latitude trims are powered by a standard 158-hp, 2.0-liter 4-cylinder that is mated to a 5-speed manual or a continuously variable automatic transmission (CVT). Also available is a 172-hp, 2.4-liter 4-cylinder paired with a 6-speed automatic or the CVT. Front-wheel drive is standard, but with the 2.4-liter equipped, two 4-wheel drive (4WD) systems are available. The more off-road-capable of the two 4WD systems is the Trail Rated 4WD system, which meets rigorous off-road standards for traction, water fording, maneuverability, articulation, and ground clearance. Inside, the Patriot’s cabin ranges from sparse to well-furnished to keep the base price very low. It is one of the few vehicles we can think of that still does not have air conditioning or power windows/locks as standard equipment. But it does offer standard satellite radio and Bluetooth calling (no audio), which is a little strange. Interior options include automatic climate control, leather upholstery, navigation, heated front seats, and a 6.5-inch touchscreen. The Patriot earned a 4- out of 5-star overall crash test safety rating from the National Highway Traffic Safety Administration (NHTSA). Standard safety features include antilock brakes, six airbags, and electronic stability control. A rearview camera and automatic headlights are also available for added safety. 47 of 49 (95%) consumers said they would recommend this vehicle to a friend.